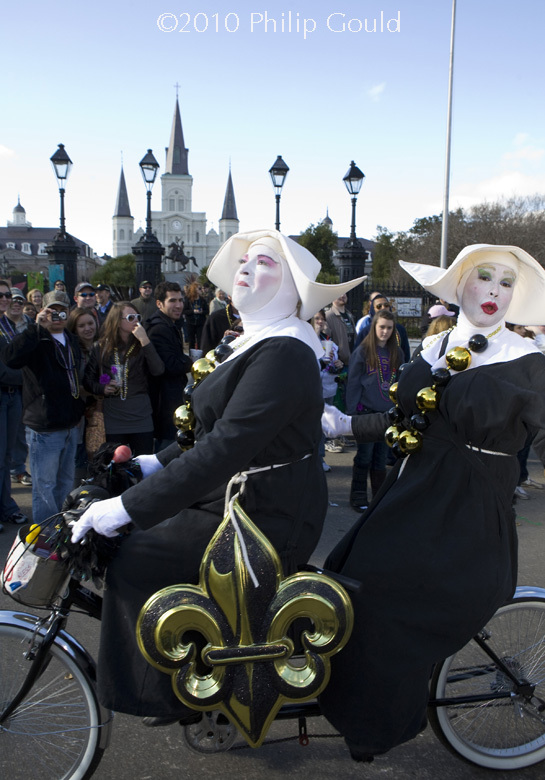 Two men dressed in drag as traditional nuns ride their bicycle built for two in a Mardi Gras parade on the day before the New Orleans Saints played in the Superbowl back in 2010. 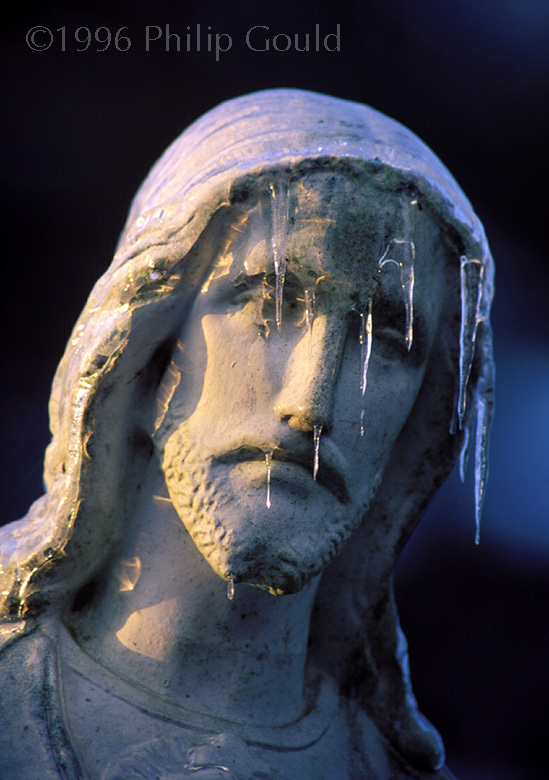 In a rare south Louisiana scene, freezing rain creates icicles hanging of the brow of Jesus on a statue facing the Academy of the Sacred Heart in Grand Coteau, LA. 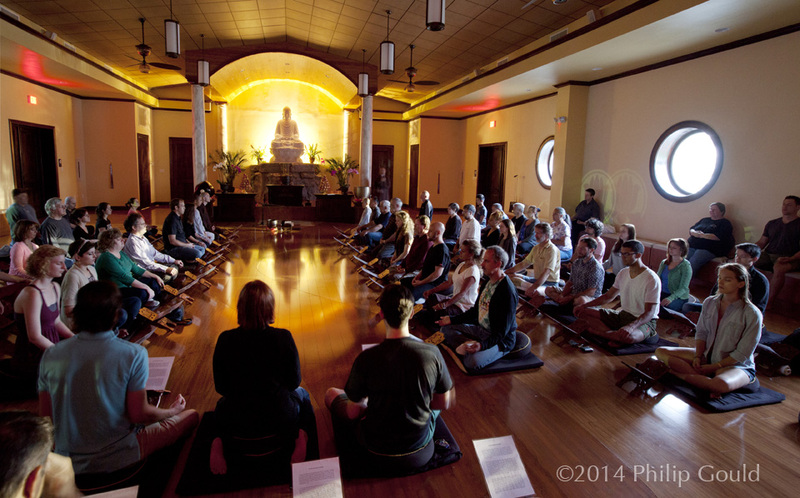 People meditate at the Tam Bao Buddhist Temple Baton Rouge, LA. 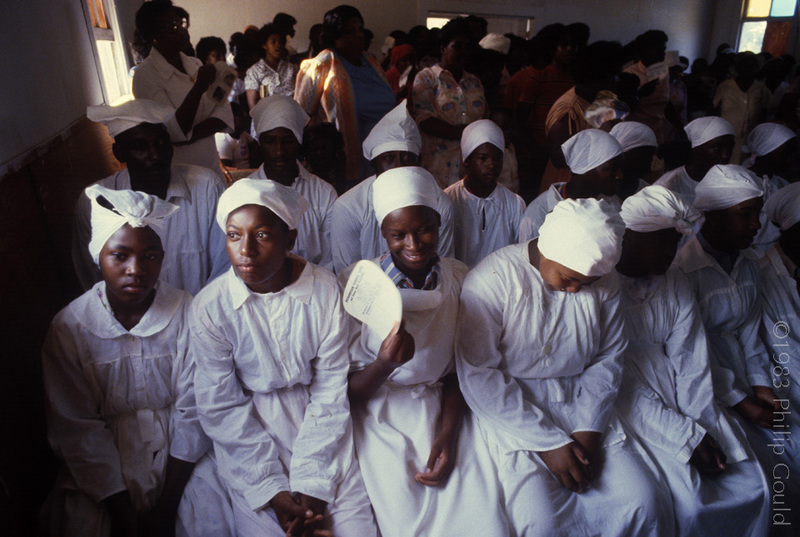 Baptism Candidates gather at a church service before proceeding to a nearby borrow pit for the Baptism ceremony. As I understand it, a borrow pit is large hole created by land taken to build Mississippi River levees most likely right after the 1927 flood. The hole floods over time creating a pond. Shaquanathie Curry listens to the minister just prior to her baptism on Cane River near Natchitoches, LA. These "Capitans" pose briefly during the Faquetaigue Mardi Gras near Eunice, LA. Each represents a reprehensible figure of history or fiction. Needless to say law, order and a bit of chaos reigned supreme during the run of this traditional style Cajun Mardi Gras. A surreal looking (my opinion) float passes through downtown Lafayette, LA during the Queen's Mardi Gras Parade. Ron Zapp, of Zapp Potato chip fame, throws beads at the start of the Spanish Town Mardi Gras Parade Baton Rouge, LA. A pair of beauty queens carry the Acadian Flag as they explore Bayou Teche in a Crawfish boat. The photo, taken as satire, was part of shoot for a Nunu's Art Collective calendar made to raise money for artists who lost work in an unfortunate fire that destroyed the original Nunu's building several years ago. Swamp tour guide "Alligator" Annie Miller feeds an hungry alligator some chicken while her boat full of retired baptists from Atlanta, GA watch with interest. Mrs. Miller led popular tours near Houma, LA until her passing. At Festivals Acadiens, the dance area in front of the stages can get dusty or muddy. In 1996, the festival saw a good bit of rain and the dance floor became a mudd pitt of sorts all for the primal pleasure of it all. 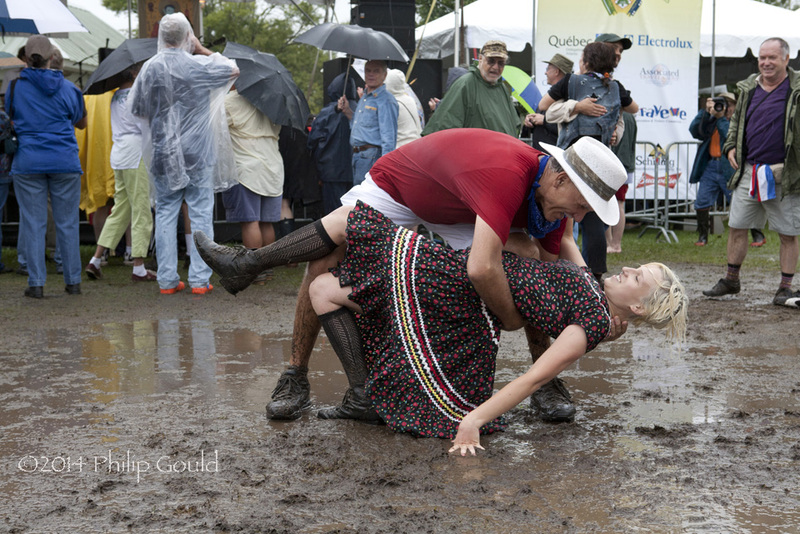 Two folks engage in a post dance dip over mud at Festivals Acadiens et Creoles in Lafayette, LA. 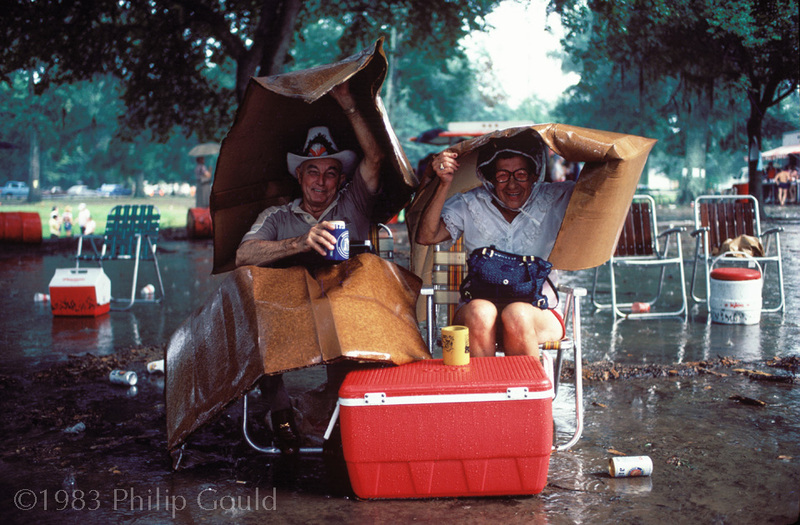 A Cajun Couple emerge from their cardboard covering after a monsoon like storm drenched Festivals Acadiens et Creoles in Lafayette, LA. David Bertrand was a leader in the Elton, La Courir de Mardi Gras. The photos says the rest. Three waiters at New Orleans' Cafe du Monde relax in the early morning until diners arrive. 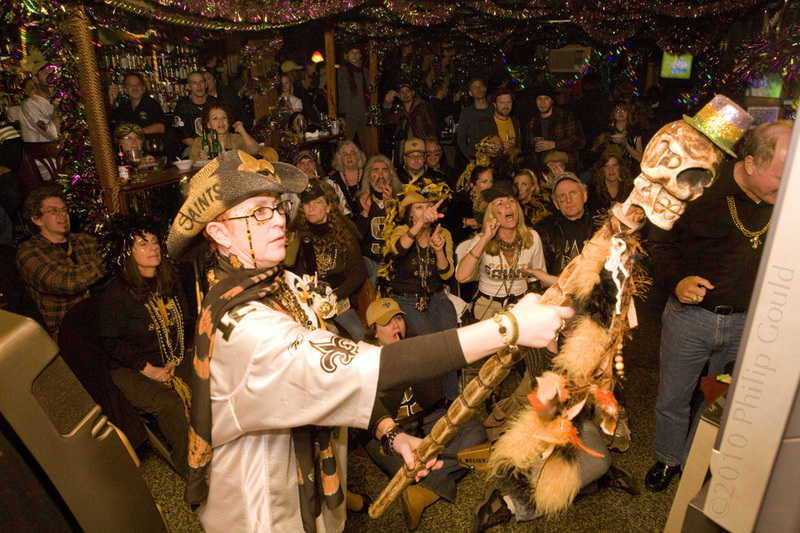 Carol Kolinchak holds a gris gris stick to the television as she and friends watch the New Olreans Saints play in the 2010 Superbowl at Vaughn's Bar in New Orleans. For the record, the prospects for the Saints improved soon after the gris gris was applied during the second quarter. The viewer is encouraged to draw his or her own conclusion. The Saints were Superbowl Champions in 2010 when Champion's Square opened adjacent to the Super Dome. Crowds could be close to ground zero during home games if they couldn't get into the Dome itself. Presidential Nominee George HW Bush as Mural in New Orleans. 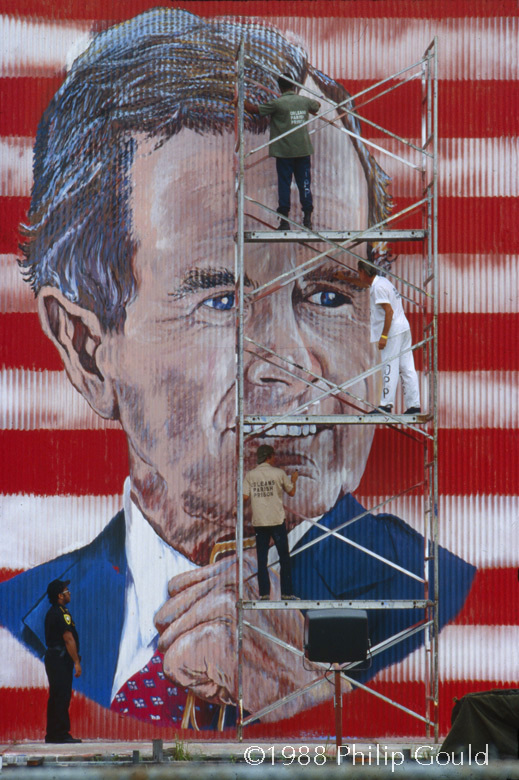 Prisoner muralists paint the likeness of then Presidential nominee George HW Bush in New Orleans prior to the Republican Convention held that year in the Crescent City. 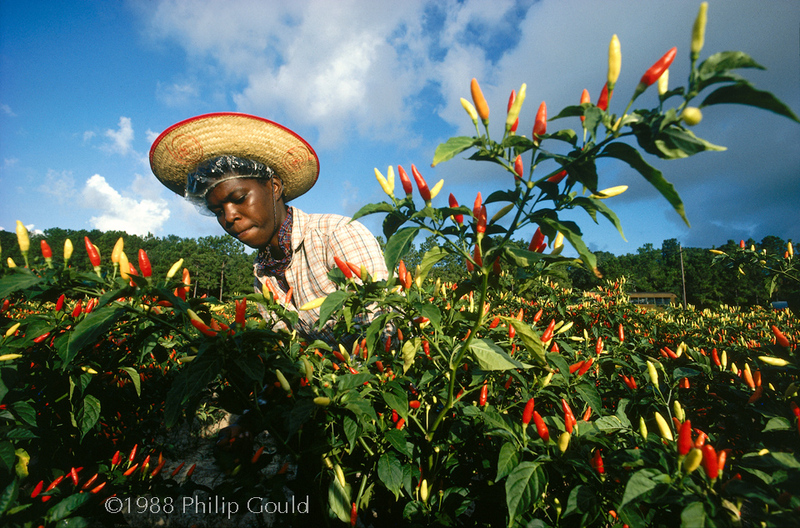 Brenda Williams picks peppers, the main ingredient for Tabasco Sauce, at Avery Island, LA. 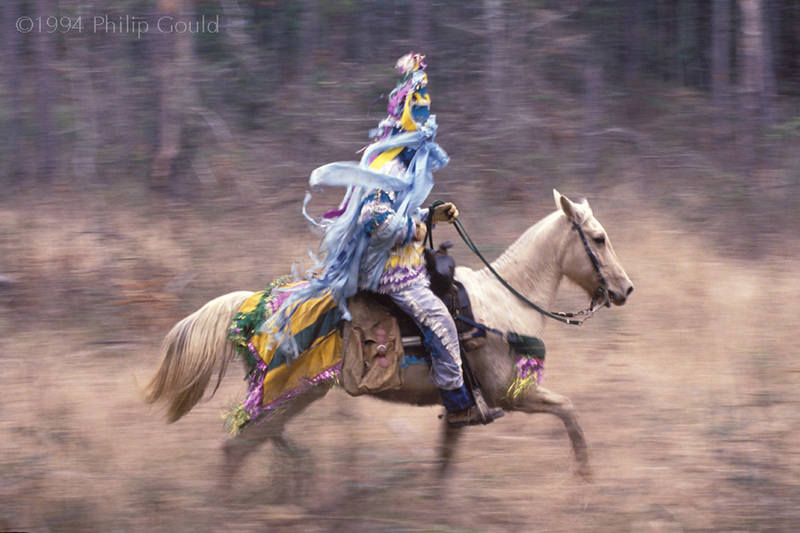 A Mardi Gras celebrant ties a chicken he caught around his neck and head as he finished the annual run through the Cajun countryside of Louisiana. Kermit Lavergne, one could say, should have been born in the 19th century. He would have felt more at home on horseback working his beloved cattle, longhorn and otherwise. But here we are. In the above photo, he is checking the age of a longhorn cow who was having trouble delivering calves. All in a day's work. 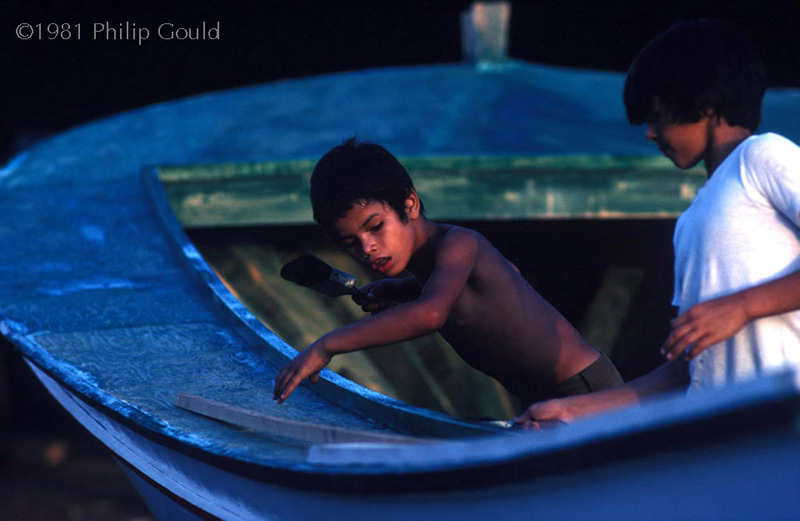 A young Houma Indian paints a shrimp boat in Dulac, LA.